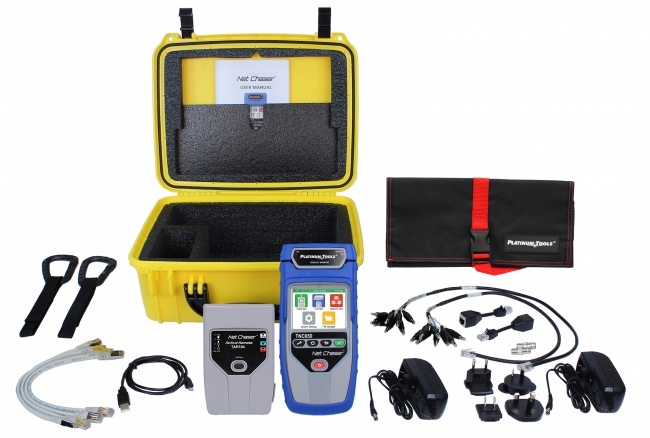 The new Net Chaser™ Deluxe Test Kit, complete with a protective hard case Made in the USA, offers a complete solution to test and speed certify the data-carrying capabilities of Ethernet network cables up to 1 Gb/s. The Net Chaser™ tests for noise in the network, detects faults in the cable wiring, and ensures that cables are able to support the speed capabilities of active equipment. The Net Chaser’s advanced discovery gives the clearest vision of network layout and interfaces between active components like servers, switches, routers, etc. All the information is collected, stored, and ready for reporting. Installers have asked for a tester that validates data cables by testing all the parameters they need to test beyond verifying proper terminations. 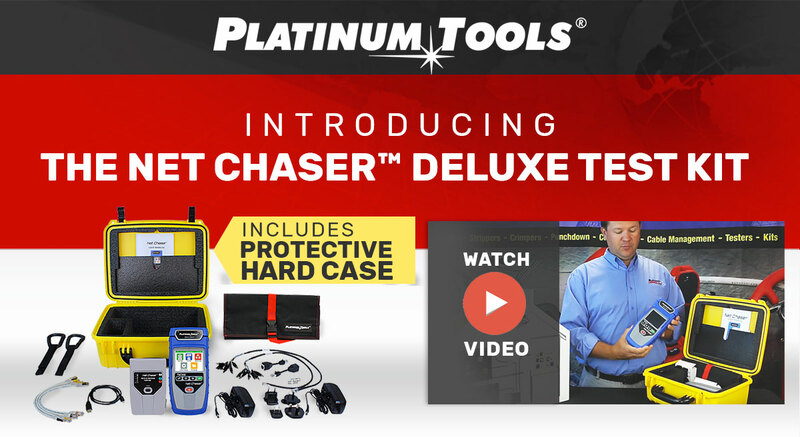 The Net Chaser is a proven product that does just that, and the new Deluxe Kit puts everything the installer needs within arm’s length and with protection from whatever the job site throws at them. Testing and ID remotes – up to eight available. The Net Chaser also includes a comprehensive set of features for testing active network capabilities, including measure Power over Ethernet (PoE) to ensure the correct power is available on the correct pins, use Port Discovery to ensure the correct speed and duplex capability are available; connect at gigabit Ethernet and run ping tests to verify connectivity to IP hosts; discover network devices using Cisco Discovery Protocol (CDP) or Link Layer Discovery Protocol (LLDP); VLAN discovery; Traceroute function displays the path internet packets travel to reach a specified destination. The Net Chaser also saves test reports and exports to PC’s in PDF or CSV format.